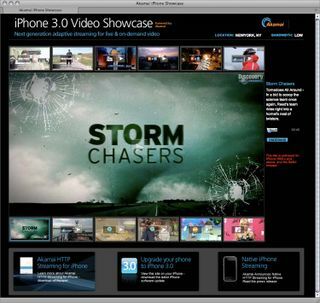 Today, Akamai "officially" announced support for variable bit rate streaming of live and on-demand video content for the iPhone and iPod touch and has launched a new showcase site at iphone.akamai.com. The site which has been live for about a month, showcases content from about a dozen content providers including FOX News, MTV and USA Today amongst others. Akamai's new iPhone streaming service is based on the standard HTTP delivery protocol which for Akamai, means they can utilize more of their HTTP network infrastructure as opposed to proprietary based streaming protocols. Earlier in the week I came across the showcase site and tested the quality and while it looks pretty good, there were times when the video appeared choppy. Hard to know what exactly caused that as the videos as they play now, don't give you any performance or quality indicators in the player to know if your connection is having problems. That's one feature I'd like to see in the player and one that most PC based video players already have built in.